David Nutt became somewhat famous in the UK when he was chairman of the Advisory Council on the Misuse of Drugs [ACMD], the statutory body which is responsible for advising the government on drug policy, and specifically on the appropriate legal classification of different drugs. He was criticised and eventually fired for being rather too vocal about the fact that the government consistently ignored the advice of the ACMD and allowed political considerations to trump politics, and for pointing out some inconvenient truths about relative harms; that alcohol and tobacco are both more dangerous than many illegal drugs, and that horse-riding is considerably more dangerous than taking ecstasy. This became a bit of a cause celèbre in the geekosphere. Because we all know that politicians will ignore the evidence if it’s politically inconvenient, but it’s rarely quite so blatant as firing someone for saying what the evidence is. This book covers various aspects of drug use: how drugs work, how harmful they are, what addiction is, what treatments are available and so on. It covers alcohol, tobacco and prescription drugs as well as the illegal ones. It’s interesting to read because it simultaneously seems radical and rather obvious. Radical because if all the evidence in the book was taken seriously it would involve a top-to-bottom rewriting of UK drug laws; and obvious because actually not much of this stuff should come as a surprise. For example, however much politicians may splutter about the comparison, can anyone who lives in this country seriously doubt that alcohol causes far more social harm than ecstasy or cannabis? Or that, purely pragmatically, treating addiction as a medical problem is likely to be more successful than treating it as a moral failing? And even if you think cannabis should be illegal, surely it makes intuitive sense that it is counterproductive to imprison users: both because being in prison is in itself more damaging to the individual’s future prospects than the actual drug use, and because it is very expensive to lock people up. It’s interesting though, and very readable. It helps that, although the book takes a ‘liberal’ stance compared to the current law, it’s not derived from a naive libertarianism. Nutt is not arguing for loosening the drug laws on the basis of increased personal liberty; he wants the law to be better at managing harms and risks. So he supports the ban on smoking in public places and would tighten some of the rules on alcohol sales. And although treating addiction to heroin and cocaine as a primarily medical problem could be seen as ‘soft on drugs’, he’s arguing for it on the basis that it is the best way to minimise harm. A few random interesting points from the book: he points out that coca leaves, cocaine and crack are all pharmacologically the same substance, and that the method of delivery makes a huge difference not just to the experience but also the addictiveness. I was startled to learn that about 500 people a year die of heroin overdoses after coming out of prison because, having stopped or reduced their use while inside, they have lost the tolerance they used to have. And I was struck by his suggestion that the duty on alcoholic drinks should be proportional to actual alcohol content, rather than by category with one rate for beer and one for wine and so on. That would be a direct incentive for drinkers to switch to weaker drinks and for manufacturers to reverse the trend of beers and wines getting stronger. Which seems sensible. There a general argument for making alcohol more expensive anyway, but it seems like a good start to make Special Brew considerably more expensive than lagers with less than half the alcohol. 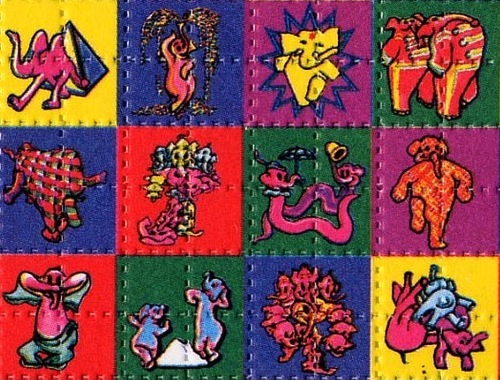 » The Pink Elephants on Parade LSD blotter is from the Blotter Art website. 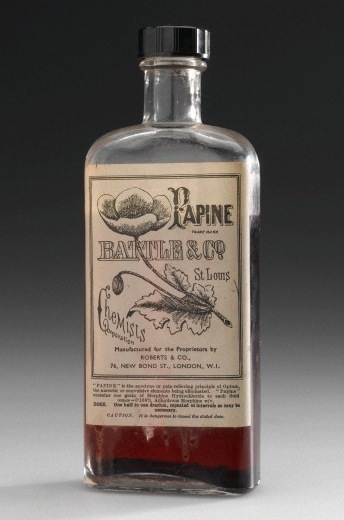 The bottle of Papine is from Wellcome Images and used under a CC by-nc-nd licence. I suppose it is true to say that in general we prefer to listen to those who agree with our views, rather than those who do not. I have not come across the publication to which you refer but the point blank refusal of government to listen to those who really know, as against those who merely have an opinion, never ceases to amaze me. I think it may have something to do with the idea that when someone agrees with them (rightly or wrongly) it appeals to their “intuitive” sense of rightness. More often than not, their “intuition” is just a mistaken example of their inability to think outside their habitual box. How long is it going to take government, and others placed in self-important positions of micro-authority, to learn that, as your author observed, alcoholism is a disease? Furthermore, alcohol addiction is only seen as more acceptable than, say, heroin addiction because alcohol is socially acceptable. After all, most of us do drink, and heaven forbid that people should learn that we are dealing with substance addiction, whatever we may call the substance. Maybe things will change, only when people become less judgemental and seek other options to the popular, and often pointless, solution of imprisonment. Self-righteousness is not the prerogative of the high and the mighty, and it is so “safe”. I imagine many British politicians would develop a less blinkered attitude to drugs the moment they thought they could do it without being torn to pieces by the Daily Mail. Ratcheting up the price of booze, though: it would take an unusually brave government to do that.